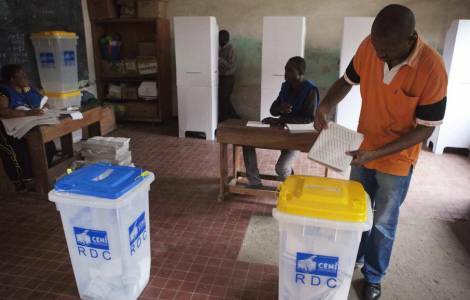 AFRICA/DR CONGO - Too many delays in the preparation of the vote; the Bishops to the UN: "The hypothesis of postponing the elections appears again"
Kinshasa (Agenzia Fides) - "The hypothesis of a postponement of the elections appears again", warned the Bishops of the Democratic Republic of the Congo in front of the UN Security Council delegation who went to the DRC to ascertain the progress of the preparation of the presidential elections scheduled for December 23rd. In their statement, sent to Agenzia Fides, after thanking the UN Security Council for the attention with which they follow the Congolese situation, the Bishops have listed those that, in their opinion, are the positive and negative points of the preparation of the December vote. Regarding the electoral campaign, it is noted that "on 29 September the political opposition held a great meeting without obstacles or violence". On the other hand, the Bishops note "the prohibition and repression of public demonstrations organized by opposition political parties and citizens' movements, as well as the confiscation of public media in favor of the dominant power persist". The Bishops have asked the United Nations to put pressure on the Congolese government to ensure that all political forces have free access to the media and remove any obstacles to the public demonstration of the opposition. The greatest concern according to the Bishops comes from the delays in the electoral machine. "There are about 6 million voters registered in the electoral register without fingerprints", recall the Bishops. In addition, the Independent Electoral Commission (CENI) is determined to use the electronic electoral machine despite the lack of consent from the parties concerned. CENI is inviting international election observation missions at a slow pace. All this makes the Episcopal Conference say that "the hypothesis of a postponement of the elections appears again". The presidential elections were scheduled by the end of December 2016, at the end of the second and last term of President Joseph Kabila. Finally the latter has announced that he will not run to obtain a third term, in violation of the Constitution, and has indicated in the former Minister of the Interior, Emmanuel Ramazani Shadary, the candidate of his party.